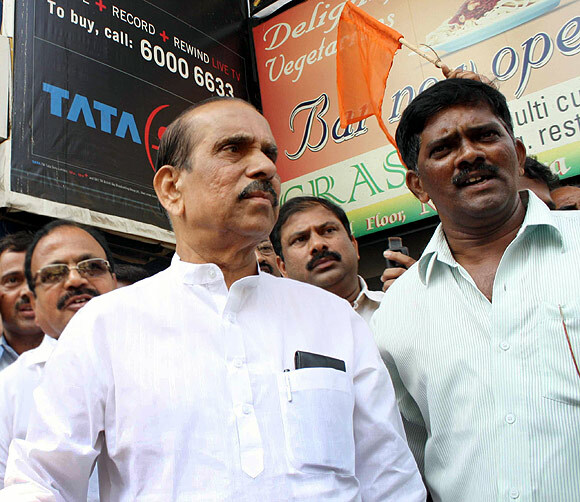 Soon after Balasaheb Thackeray passed away, Shiv Sena leader Manohar Joshi demanded that the late Sena leader's cremation site be converted into a memorial, leading to a stand-off with the state government. Within the Sena, there were suggestions that the memorial could come up at Kohinoor Mills, co-owned by Joshi's family. In the second part of Rediff.com's exclusive interview with Manohar Joshi conducted some months ago, the former Lok Sabha leader clarifies these issues. He also tells Savera R Someshwar about the relationship he shares with Uddhav Thackeray today. Considering the fact that you wanted a memorial as the site of Mr Thackeray's funeral pyre, as you satisfied with the revised solution that has come up for the memorial? We have requested them to allow us to construct a small structure at Shivaji Park. According to me, the minimum size of the structure we expect is about 100 feet; it is not a big memorial as such. The original area where his body was cremated... a temporary samadhi came up there which was removed later. It was not something that you originally wanted. Would you agree? As I said, nothing is finalised. As soon as it is finalised, we will put up a structure and then everybody will come to know. 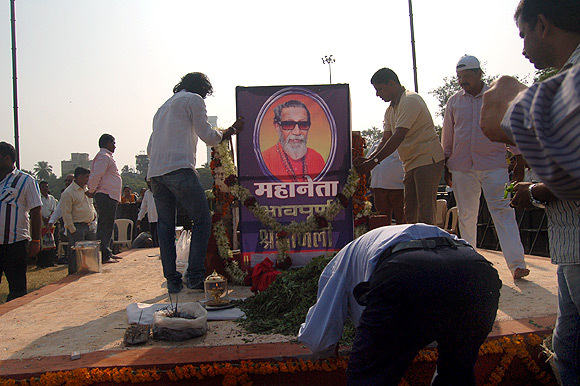 Image: In Mumbai's Shivaji Park, Shiv Sena supporters pay their last respects at the site where Bal Thackeray was cremated on November 19, 2012. 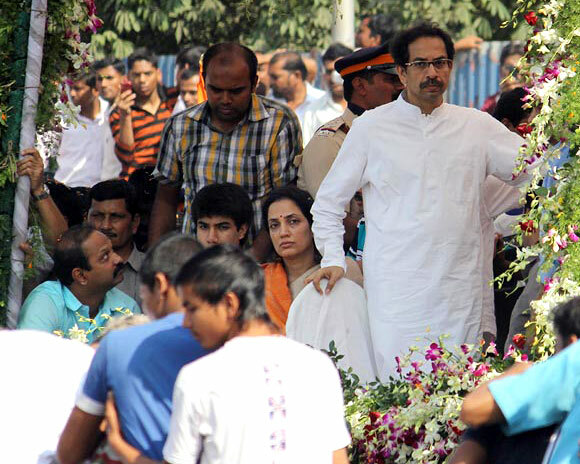 Did Uddhav Thackeray discuss the decision of moving the temporary samadhi from the funeral pyre site with you? Not at all because, on that day, I may not be available at that particular time. He has every right to do that. Are you seen as a threat to Uddhav Thackeray? I have never thought of this because, in the Shiv Sena, people don't form groups or try to bring somebody down. As a leader of the party for the last 45 years, I'm supposed to be responsible. I have never tried to do that; I don't know how to do that. 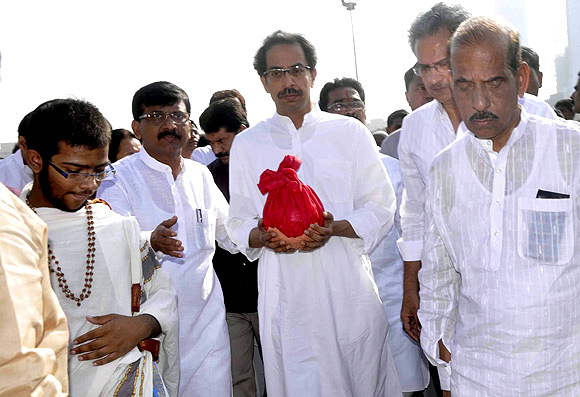 Image: Uddhav Thackeray, accompanied by Manohar Joshi and other Shiv Sainiks, collects the ashes of his late father. Why are so many in the Shiv Sena opposed to you? There are some people whose business is to criticise (laughs). There is no specific reason. It does happen in politics that the criticism goes on. You can't take it to heart every time. My only expectation on this is this: If a reporter comes to know something, he should ask that person and then publish if he wants to publish against him. Within the Sena too, there has been criticism. Nobody came to me personally anytime so far. Nobody. I do both the things together -- business and politics. I have now given the business to my son who looks after it so, at this point in time, I am not concerned with it. Criticism should not worry you... Only the criticism, if it is true, you must try and improve yourself which I have been doing whenever possible. Image: Manohar Joshi says he is not fazed by criticism. Since we are talking about criticism, is it true that you refused to give land at Kohinoor Mills for Mr Thackeray's memorial. One thing, nobody asked land from me. Another thing, I wanted the media to understand the issues properly. I'll tell you generally what happens to purchase a land. You offer money. Then you take finance. Or you get a partner. Everything is being done by my son now. He is an architect. After he took the finance, partnership problems arose and his partners went away. He was left alone. Then he brought some more finance from some other institution. You'll be surprised to know, three buildings have been already completed. How could the media do this? They should go and see what's happening on the site. They should try to understand the issue. Suppose the owner of your newspaper tells you tomorrow that since you are in my newspaper, if you want to continue, then you give up this property. Will you give? You want to become a beggar again? You've not really clarified your stand. Let me tell you honestly, I swear on God and say Mr Uddhav Thackeray never asked for this. He is very decent. Without anyone asking me, raising the matter publicly like this is not desirable. Image: Uddhav Thackeray, his wife Rashmi and other members of the Thackeray clan accompany Shiv Sena leader Bal Thackeray on his final journey. What is your relationship with Uddhav Thackeray like today? Do you feel you are being sidelined in the party? Do you feel that too many people are objecting to your suggestions? Nobody, except for the media, if they have no other story (laughs). How is the Sena preparing itself to face the next national election without Mr Thackeray? Our usual activities aimed at helping the people are going on. To what extent will Mr Thackeray's absence impact you? Personally, very much. Whenever he went for any small (public) meeting, he would always take me. In fact, I used to speak first and he would speak thereafter. My speech was for 10, 15 minutes; his speech was always for one hour. If he held a public meeting, it would be the same. But the audience would not be less than one lakh. He may have been the first leader whose meetings were attended by such a large number of people. 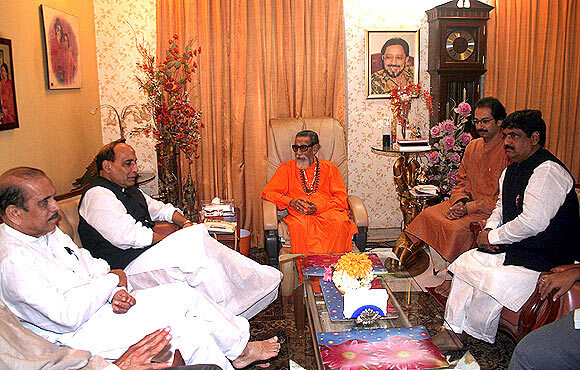 Image: Bal Thackeray, Manohar Joshi and Uddhav Thackeray meet with senior BJP leaders Rajnath Singh and Gopinath Munde. How will you be involved in the Sena's public meetings? As soon as it is declared, they declare the names of those who are going to be the speakers. If my name is there, I will go. If my name is not there, it means I am not expected to attend. During Balasaheb's time, the names would be printed in the newspaper of the Shiv Sena, Saamna. When we saw our names, we always used to go. Mostly, (Sena leader and executive editor, Saamna) Sanjay Raut and I would be named. So, if I find my name, I will definitely go. So that's how you come to know if you are supposed to go or not? Haan (Yes). In the Shiv Sena, they don't write letters to the leaders. Haan (Yes). Those who are not supposed to speak, they don't call. So it is just written in Saamna and that's how you know? 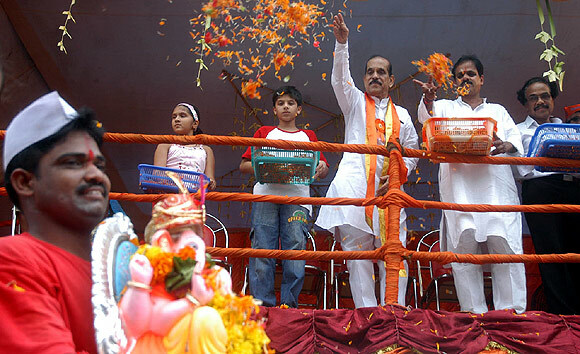 Image: Manohar Joshi is one of the Shiv Sena's senior-most leaders.